Royal Wheels India is an adventure travel group organising East India Tours Package. 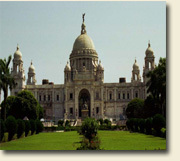 Calcutta is the largest city in India, indeed one of the largest in the world. Established as a British trading post in the 17th century, the city rapidly grew, acquiring a life and vibrancy of its own. Its glory is still reflected in the buildings of Chowringhee and Clive Street, know as Jawaharlal Nehru Road and Netaji Subhash Road respectively. It is a city which leaves no-one indifferent-fascinating, effervescent, teeming with life, peoples, cultures. The impact can be a shock at first; the rickshaws, cars, brightly painted lorries, trolley buses, the cries of the street vendors, labourers hard at work on the construction of the vast underground railway, the noise and colour of the huge New Market, the bustle of the crowds...but soon the jumbled impressions will sort themselves out. Central Calcutta is best viewed in perspective around the rolling green of the Maidan, 3 square kilometres of parkland where the early-morning yoga sessions provide for the city dwellers a relaxation from the stresses of urban life. For relaxation of another kind, visit the Indian Museum, one of the finest in Asia. Other attractions include the huge white marble Victoria Memorial, the Octherlony Monument and the headquarters of the Rama Krishna mission. To the north of the city is the silent beauty of the Belur Math and, across the river, the Botanical gardens (with a 200 years old Banyan tree, reputedly the largest in the world) and the Kali temple of Dakshineshwar. Calcutta has a soul. The Bengalis are poets and artists of India and this has affected their city. Calcutta will certainly grow on you. For a complete change, take a plane or boat from Calcutta to Port Blair in the Andaman and Nicobar Islands, the peaceful sun-soaked paradise in the Bay of Bengal. Invigorated by the fresh mountain air, stroll along the winding paths, marvelling at the views of the massive range of snowcapped peaks which appear in all their glory as the swirling mists clear. See the Buddhist prayer flags fluttering in the breeze; it is possible to visit one of the Buddhist Monasteries, such as Ghoom which enshrines an image of the Maitreyee Buddha. Only two and a half hours away by bus or taxi is Kalimpong, a quaint bazaar town set in rolling foothills and deep valleys at the foot of the mighty Himalayas. There are several excursions from here to places which offer some of the finest panoramas in the world. To the north, the mountain state of Sikkim is a land of peace and tranquillity high up in the mountains. The capital Gangtok, on a ridge flanking the Ranipool River, is overshadowed by the Kanchenjunga, a truly spectacular sight that will imbue you with awe and wonder. Discover the ancient beautiful Royal Chapel of Tsuk-La Khana, or enjoy the profusion of wild flowers in bloom throughout the year. Here in orchid-strewn Sikkim the visitor becomes like an explorer who has found a forgotten land. Even further east are the states of 'Assam and Meghalaya. The state of Assam is famous for its tea, and also for its wildlife reserves which can be reached via the ancient and graceful state capital of Gauhati, situated on the river Brahmaputra. The tiger reserve of Manas is also rich in other varieties of wildlife, while in Kaziranga it is often possible to see one of India's one-horned rhinoceros. Bordering Assam to the north is the beautiful mountain kingdom of Bhutan. Shillong, the capital of Meghalaya, is the home of the colourful Khasi people. The breathtaking views, the waterfalls, brooks and pine groves have all led to the state being popularly described as "The Scotland of the East"; Shillong also has one of the best golf courses in India. The landscape, the people and the climate all combine to make it an ideal holiday resort throughout the year. Orissa, the eastern state of the Bay of Bengal, has a rich tradition of classical dance, music, silverware, handicrafts and sculpture. The three great temple towns of Bhubaneswar, Puri and Konark constitute, like Delhi, Jaipur and Agra, a "Golden Triangle", but here with the emphasis strongly on temples - temples of the most glorious and stunning kind. 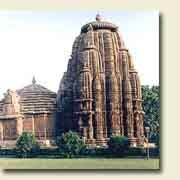 Bhubaneswar is the capital of Orissa and the Temple City of India. Seven thousand temples once ranged around the sacred Bindusagar Lake in Old Bhubaneswar; about five hundred of them are still standing. 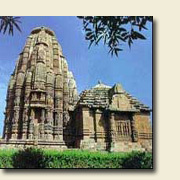 The great Lingaraja Temple dedicated to the Lord Shiva is the largest of these, and is the site of a major Shivartri festival in February-March, on the night of the new moon. On the coast, south of Bhubaneswar, lies Puri, one of the four holiest Hindu cities in India and now also being developed as a beach resort; relax in the refreshing sea after wondering at the famous 12th century Jagannath Temple, the home of Lord Jagannath, the Lord of the World, "the Formless God". Many travellers try to be in Puri around June or July, when it is possible to join in one of India's greatest festivals the spectacular Rath Yatra or "Car" Festival, when a concourse of pilgrims gather to pay homage to the images of the deity drawn on their massive wooden chariots. Splendidly alone amidst the sand dunes which rise from the blue waters of the bay, the Sun Temple of Konark marks the pinnacle of a great Kalinga achievement in temple architecture. It was built as a chariot for the Sun God, complete with wheels and horses. The sculpture is among the most stupendous in India. After seeing these, and so many other, remarkable sights, relax with the friendly people by the flat and beautiful Chilka Lake, or in the little beach resort of Gopalpur-on-Sea. The excitement and stimulation of busy Calcutta, the tranquillity and ecstatic beauty of the Himalayas, the dream-like quality of the ancient holy cities - what spectacular and varied offerings eastern India has to give. Consisting of Assam, Meghalya, Mizoram, Manipur, Arunachal Pradesh, Nagaland, Tripura and the state of Sikkim. Air: airports are Bagdogra, near Siliguri and Guwahati along with Tezpur, Jorhat, Lilabari and Dibrugarh and these have connections within the North East. Rail: Fast and convenient rail connections to the gateway cities from both Delhi and Calcutta. Road: Most of the north east is well connected. Though the distances are short, being hill areas, journeys could be time consuming but yet this may well be the best way to discover the land and its people. The accommodation is modest but comfortable. State governments provide the main accommodation network in this area. Tented accommodation is also available for adventure tourism.